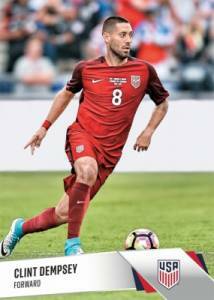 Tapping into the excitement around World Cup qualifiers, 2017 Panini Instant US Soccer National Team continues the on-demand trend by giving collectors a factory set containing players from both squads. 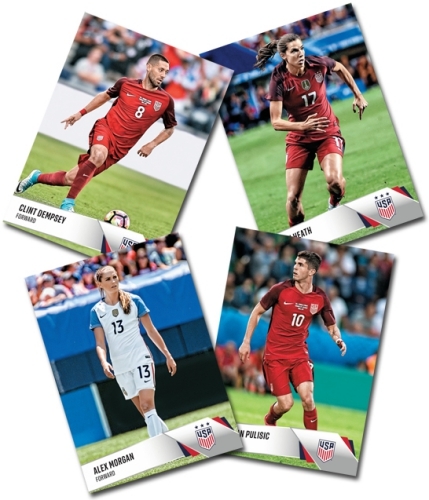 Totaling 24 subjects, the Panini online exclusive includes cards for the United States men's and women's national soccer teams. Each team set highlights 15 male players and nine female players. More specifically, the set features some of the biggest USMNT names, including Christian Pulisic, Clint Dempsey and Jozy Altidore. Meanwhile, Alex Morgan, Carli Lloyd and Tobin Heath are among those representing the USWNT. Unlike most Instant sets, 2017 Panini Instant US Soccer National Team does not offer any parallel cards. All cards are packaged and shipped in a protective case that has the official Panini seal. 2017 Panini Instant US Soccer National Team Collection is priced at $19.99 with free shipping within the United States through the Panini Online Store. Collectors should note that the selling timeframe was not mentioned. Panini also has their famed World Cup sticker sets primed, including a precursor to the 2018 release. 24 cards. Cards are sold as a team set. Shop for Instant US National Team sets on eBay. 2016-17 PANINI NOIR SOCCER SEALED 3 BOX HOBBY CASE MESSI? RONALDO? 2016 17 PANINI REVOLUTION SOCCER HOBBY BOX LOT OF 3 - AVG 1 AUTO EVERY 2 BOXES!